Sarah Maslin Nir wins June Sidney for “The Price of Nice Nails” and “Perfect Nails, Poisoned Workers, an investigative series for the New York Times. New York City is the manicure capital of the nation, home to 2,000 of the nation’s 17,000 nail salons. Once an occasional luxury, painted nails have become a grooming staple for women across the economic spectrum. Immigrant women bear the brunt of this “affordable luxury.” Maslin Nir interviewed more than 150 nail workers in the course of her 13-month investigation. Only one in four reported earning at least minimum wage. Manicurists may earn as little as $10 a day. Ten or 12-hour shifts are routine. One 24-hour salon made manicurists live on premises and kept them on call around the clock. Workers also reported physical abuse, wage theft, and tip skimming. Trainee manicurists don’t get paid at all; in fact, they are expected to pay their employers to learn their jobs. Nail salons may also put workers’ health at risk. Chemicals found in nail polish have been linked to cancer and birth defects. Dust from nail sculpting can cause chronic nosebleeds, asthma, and lung damage. Manicurists are at high risk of contracting warts and fungal infections from their clients. So far, the effects are not being seen on the ground. Unions and community groups – including the New York Healthy Nail Salons Coalition, which has been advocating for salon workers for years – are on alert to make sure that the state makes good on its promises. 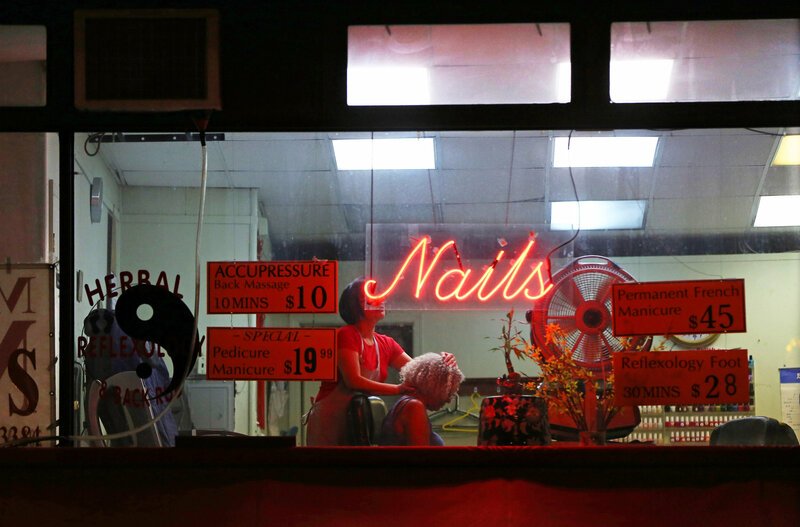 Workers United NY/NJ Regional Board has announced a Nail Salon Organizing Project. Sarah Maslin Nir has been a staff reporter for The New York Times since August 2011. She currently covers Manhattan for the paper’s Metro section. Prior to that, Nir worked as a rewrite reporter for late-night breaking news. From 2010 until the end of 2011, she was The Times’ “Nocturnalist” columnist, covering New York City’s nightlife. At May's Nails Salon on West 14th Street in Manhattan, a customer gets a neck massage while her nails dry. Q: The minimum wage in New York is $8.75 an hour. How do salons get away with paying so much less? A: It’s a twofold problem: The worker population speaks little English, is undocumented for the most part, and unaware in many cases of what they should be being paid. In addition, they owe crushing debts to snakeheads who smuggled them from China, or coyotes who brought them from Spanish-speaking countries, and so feel forced to take whatever job they can get. But this second part speaks to why it has perpetuated: I found there was little or no oversight from the very government agencies responsible for making sure this doesn’t happen. They’re just not there. Q: The number of salons in New York City surged in the early 2000s. Why do you think the industry took off here when it did? A: We really struggled to pin down this answer ourselves, but the closest thing we could really figure, is that once the exploitative model took hold – and I say this with tongue firmly in cheek– why not open a salon? Any business would be appealingly lucrative if you’re paying no overhead in the form of things like wages. Q: A lot of people assume that tipping generously in cash offsets the low wages of nail salon workers. What did you learn about tip-skimming? A: Tip skimming is widely prevalent, in particular when tips are on credit cards, but even when they’re not, they are docked for things like spilled polish, working too slowly and other infractions. Q: What has state and local government done to improve the working conditions of salon workers since you started investigating this issue? A: The state government which is responsible for enforcement on wage violations and more, has launched a multi-agency Nail Salon task force which is taking a many-pronged approach to the problem. Nail salon workers in New York will be required to wear gloves, and respirator masks when performing certain procedures, and salons will be required to be ventilated, catapulting New York State from almost no safety standard to the strictest in the nation. Salons will be required to have a type of bonding, or insurance, so in the event they do defraud the workers and are found guilty of it, they can’t slip away without paying, as is typical. The licensing procedures are being revamped, so that workers have an easier time entering into the workforce, and every salon must now post a Nail Salon Workers’ Bill of Rights in ten different languages, among other things. Q: What do the city and the state still need to do to create a safe and fair workplace for nail salon workers? A: Follow through on these promises. I still have yet to see a gloved and masked workforce as I pass through the city streets. I have heard of bosses making workers sign false affidavits declaring they are properly compensated, I have not see a single Nail Salon Workers’ Bill of Rights up in the two weeks since the rule was made. I am expecting the process will take time, but I am keeping a close eye on the developments. The federal government however, could take real steps to updating the over 75 year old law that governs the chemicals that go into cosmetics. Currently there is no required pre-market testing, and we use over 1,200 chemicals that are banned in places like the European Union in our nail products, makeup, and other toiletries. Updating that antique law will be a major step for all of our health. Q: What language barriers did you face in reporting this piece, and how did you surmount them? A: I worked with an incredibly talented team of translators, two in each of the languages manicurists in NYC speak predominantly. Chinese: Yuhan Liu, Heyang Zhang; Korean: Jiha Ham, Yeong-Ung Yang; Spanish: Julie Turkewitz, Isvett Verde. They helped me surmount every barrier.